Like his father, Giuseppe Domenico Scarlatti (October 26, 1685 - July 23, 1757) was a well-trained and professional composer able to write successfully for a number of genres. Unlike his father, he found the keyboard composition sufficiently challenging and inspirational for him to be content for supplying his patroness with over 500 such works, a project which fully occupied his last two decades. These extraordinary works form the basis of his present-day fame. 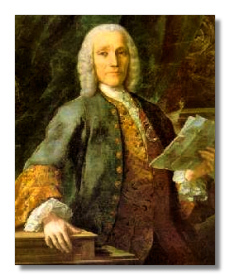 Domenico Scarlatti brought an original compositional approach to his harpsichord works, which stand at the center of his artistic achievement. Apart from technical advances, such as the novel idea of crossing the hands on the keyboard which was to be taken up by piano composers such as Franz Liszt and Felix Mendelssohn, Scarlatti used simple musical forms within which he found endless variety of expression. His harpsichord pieces, invariably short and to the point, use a vast array of rhythms and expressive devices, and range from the most formidably challenging to the simplest and purest of melodies and chord sequences. His constant search for freshness of expression led him to employ unusual and exiting harmonic patterns and voicings. Although he wrote for an instrument which was later to be supplanted by the piano, the fecundity of his inspiration and the directness of his message makes itself felt to the listener whether it is played by Horowitz on a modern grand or Scott Ross an authentic instrument from Scarlatti's day. Domenico was the sixth son of the famous Alessandro Scarlatti. Brought up in a household dedicated to music, it is no surprise that he showed his musical leanings early in life. He was taught first by his father, but before he was 20, Alessandro recognize that his son's fascination with the harpsichord would need nurturing in an artistic climate more kindly disposed towards keyboard virtuosity than late 17th-century Naples, where the organ was considered the prime instrument. Domenico was organist in the royal chapel where his father was maestro di capella and traveled with Alessandro to Florence and Rome before returning alone to Naples where three of his operas were produced, the last, Irene, in 1704. Yet he felt unfulfilled, and his father encouraged him to explore as far as Venice in search of a sinecure which would give him the creative recognition he sought. A letter from Alessandro to Fernando de Medici in 1705 craves the Duke's indulgence with regard to his son when it comes to "opportunities…for making himself known – opportunities for which it is hopeless to wait in Rome nowadays", but there was no opening in Florence, so Domenico pressed on to Venice in the company of the Neapolitan composer and musician, Nicolino. There he had more luck, for he remained in Venice for about three years, learning much from teachers such as Francesco Gasparini and gaining the friendship of a number of young composers. Among them was the English harpsichordist Thomas Roseingrave, who (according to Dr. Burney) regarded Scarlatti as exhibiting "every degree of perfection to which he thought it possible he should ever arrive, that, if he had been in sight of any instrument with which to have done the deed, he would have cut off his own fingers". 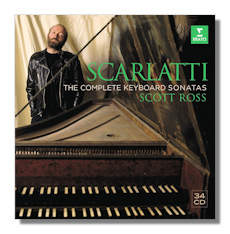 Roseingrave carried the new of Scarlatti's excellence back to England, in so doing laying the foundations for a long-lasting Scarlatti influence in English keyboard practices. While in Venice Domenico also became a friend of Handel's whose excellence as a harpsichordist matched Scarlatti's, although Handel surpassed him as an organist, a fact Scarlatti was happy to concede, commenting that he had never conceived the existence of such organ playing. The two men remained in touch for the rest of their lives, and always spoke on each other's gifts with admiration. In 1709 Scarlatti and Handel left Venice for Rome, where they visited Cardinal Ottoboni's Accademie Poetico-Musicali. Scarlatti then entered the service of the Queen of Poland, Marie Casimire. He wrote eight operas between 1709 and 1715, all except the final one (an early setting of Amleto), composed for the Queen's private theatre. Further positions in Rome followed, including that of maestro di capella at St. Peter's Basilica. In 1717 he gained legal independence from his father, and two years later left Rome, ostensibly for London, where his opera Narciso was performed in 1720, although his actual presence in London at that time is impossible to verify. His next confirm sighting was in Lisbon later the same year, where he became maestro to the royal chapel and tutored the King's younger brother and daughter. By now approaching his thirtieth year, Domenico was still unable to settle down, despite his great popularity at Court, and is known to have visited Naples and Rome during the course of 1724-25. At the age of 33, Scarlatti married Maria Catalina Gentili who bore him five children. Domenico and his wife returned to Portugal from Rome in time to be taken as members of the newly-married Princess Maria Barbara's entourage to her new home in Madrid. Scarlatti was to serve the new Queen of Spain faithfully for the rest of his life. Scarlatti's fidelity was rewarded with a Spanish knighthood in 1738. On the Queen's death he was left 2,000 doubloons as a mark of appreciation for his "great diligence and loyalty". That the Queen also frequently helped him out of financial difficulties caused by his inveterate gambling shows the extent of her indulgence. Scarlatti's wife died in 1739, but he remarried in the early 1740s and although now on his mid-fifties, he sired a further four children. Like his father he was regarded as a modest and charming man, unlikely to resort to arrogance or displays of petulance, and this no doubt endeared him to the Queen and other composers. That he had not great ambition apart from creating his music is demonstrated by the fact that although he wrote nearly a dozen operas, many religious works and over 500 harpsichord sonatas, only 30 of the sonatas were published in his lifetime (under the title Essercizi per gravicembalo and dedicated to the King of Portugal) in London in 1738. The remainder, apart from a collection of 42 suites printed under the auspices of Thomas Roseingrave, remained in the possession of the Portuguese royal family for whose sole pleasure they were composed. They were kept in 15 morocco-bound gold-inlaid volumes, and comprise the heart of Scarlatti's posthumous keyboard reputation. Scarlatti lived out the rest of his life at the Spanish Court, continuing to supply new compositions until just prior to his death. The single-voice Salve Regina is generally thought to be his last composition. He died at the age of 72 and was buried in the Convent of San Norberto in Madrid.